Tritogo is a new travel website and App, to search for hotels, flights, car hire, tours and travel insurance. Being founded by an Italian (maybe the first travel site of this kind founded in Italy!) and being our blog about Italy we want talk about Tritogo Travel ! Only 5 months old, already reached more than 16000 followers from twitter, e facebook !!! Tritogo is very easy to use to search hotels, flights, Car Rentals, tours with really good prices and offers, also allow to buy a travel insurance. 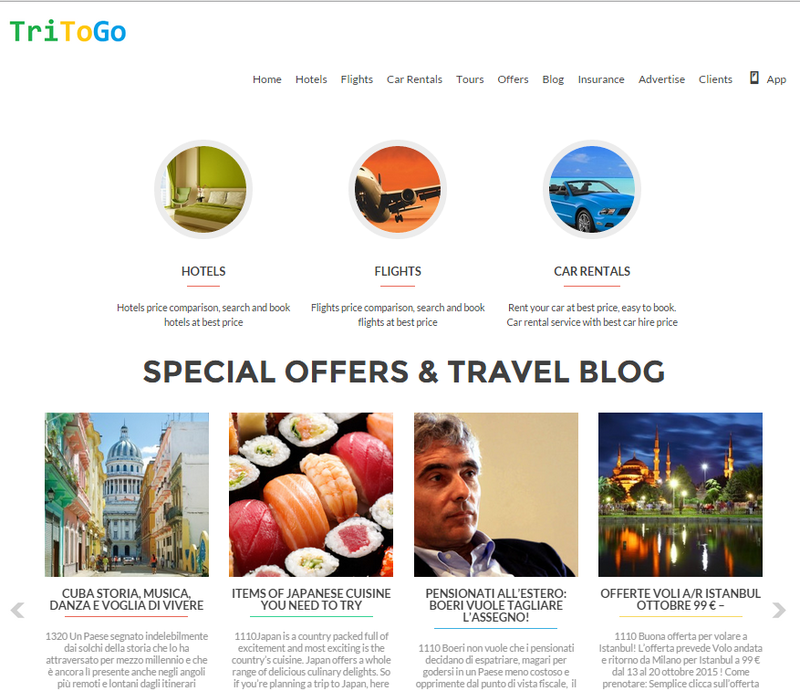 Tritogo show you also a special offers section and a travel blog. Why Tritogo is better than other competitors?! There are many travel websites and most famous than Tritogo, but we think it has some better features than the others. For example on most travel websites you can search only hotels, flights and car hire, while Tritogo also allow to search tours on main destinations around the world; you can buy a travel insurance, you can read about daily special offers and a travel blog. So not only an hotels, flights, car rentals search engine! For us these features reward this new travel website that become a real online travel agency ! At the end of best features of Tritogo we also have an online assistamnce via chat. We want also remember that Tritogo is founded by Filippo Martin a young Italian business man! What customers think about Tritogo?! We asked through social networks some customers’ opinions and all of them are positive. At first they said that prices are really incredible when they booked flights and hotels, and the online assistance or on social as facebook is very good; Tritogo offer full and good assistance!